Kind of a dour look from the Topps boys, no? That Mars Attacks logo pegs the second scan to Topps proper methinks. I also have to think this shot was the one used officially. I tend to be in the 1965 camp for the Soupy set, although most sources cite 1967. Either is possible but there seems to be more evidence for the earlier date, at least to my mind, as Soupy-mania was in full swing in 1965. Len Brown was a protege of Woody's and perhaps his most successful one. 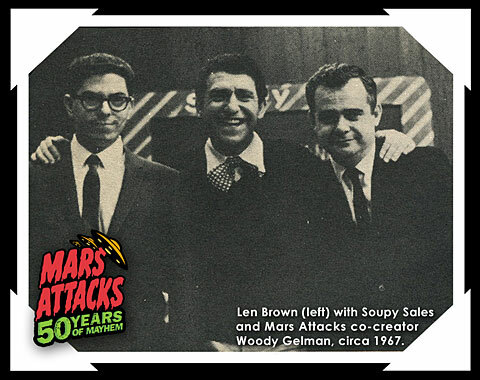 Brown succeeded Gelman as Creative Director of Topps, having been hired by Woody as a 17 year old. Brown worked on such things as the 1960 Baseball set, Mars Attacks, Civil War News and obviously Soupy Sales before ascending to Woody's old position upon the latter's retirement (which I think was in 1972). More REA goodness this week kids! 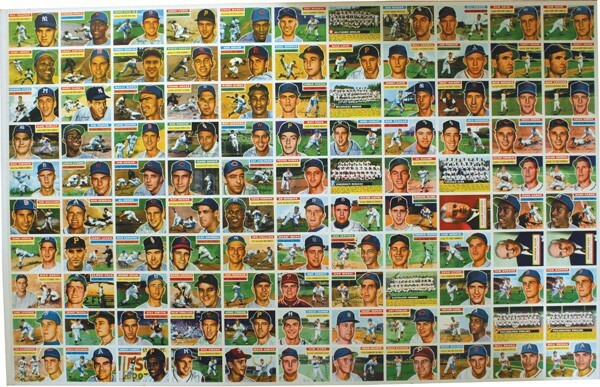 Uncut sheets often tell a story about production methods and this one is no exception. 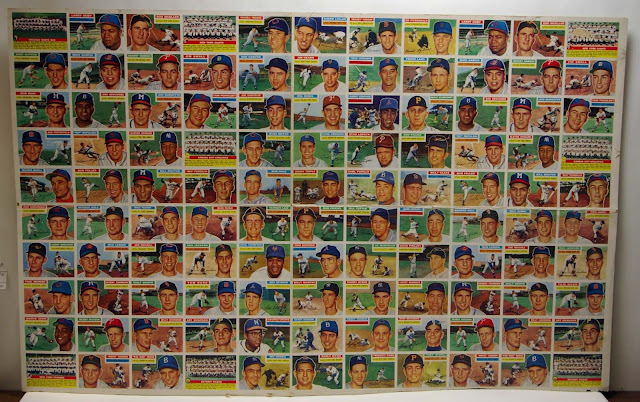 Topps used 110 card press half sheets in 1955-56, increasing from 100 card arrays in 1952-54 without changing their main card size, which at the time was referred to as Giant Size (2 5/8" x 3 3/4"). You would think then that a 100 or 110 card series or set would make a lot of sense but generally things didn't work that way. If this was the annual Baseball issue, Topps would have another half sheet for each series, usually with a slightly different array. They most likely did these due to the sheer volume of Baseball sold each year vs other series like Flags and had a need to print things a certain way. 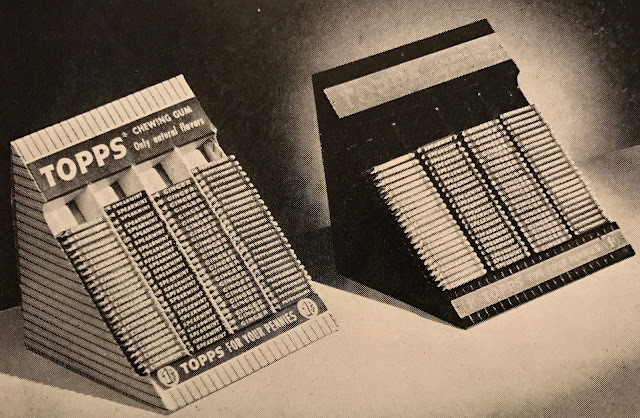 Some of the print arrays were influenced by packaging patterns as well. 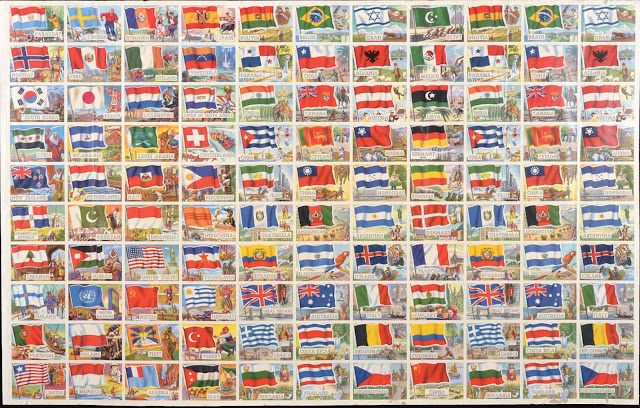 If we could find the other half sheets for 1956, I'd bet all the repeats are in the rightmost columns. Now, the question is, what did this allow Topps to do? I mean, every kid must have wanted an extra card of Warren Giles, right?! The recently concluded Robert Edward Auctions spring spectacular had a huge array of vintage goodies as usual. 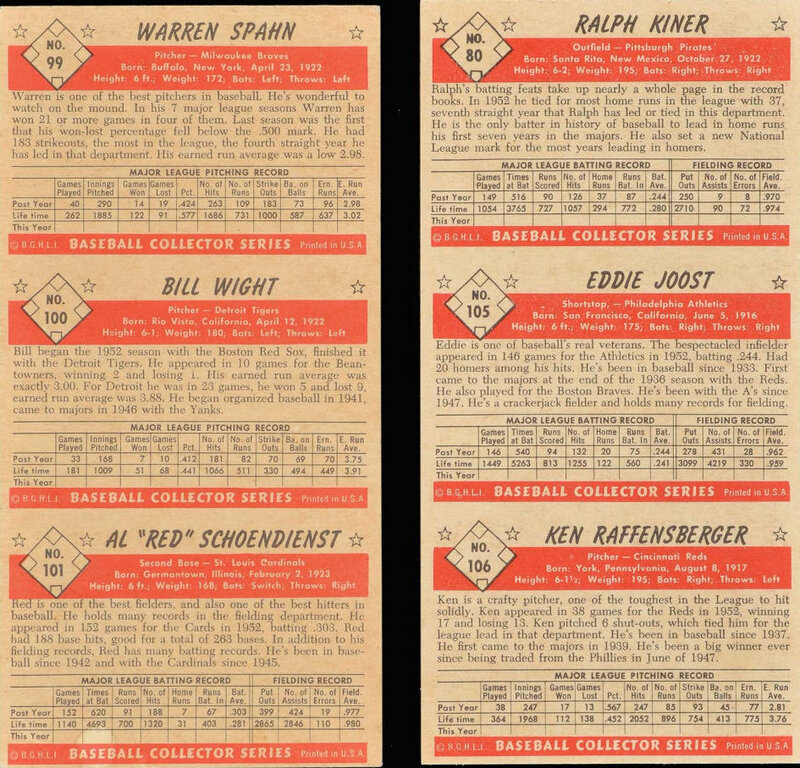 There were, scattered among the pages of their phone book sized catalog , a number of Saleman's Samples from Topps and Bowman. I've shown Bowman samples from 1950, 1952, 1954 and 1955 recently and don't like to repeat myself if I can help it, so will focus on the lot of 53's that was offered. 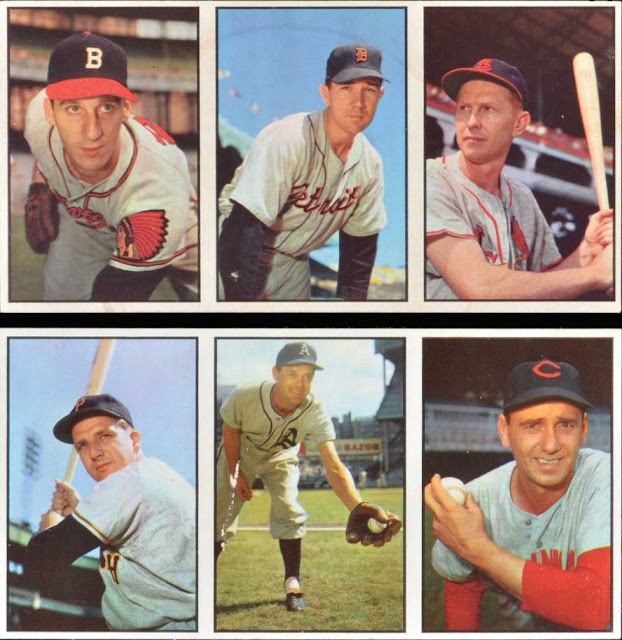 The 20 years of leadership refers to their first issued set, when the company was known as Gum Inc., although the first cards appeared in 1933 and they were all non-sports. Gum Inc. competed directly against Goudey and those were the two major issuing companies in the years leading up to World War 2. I've always liked these samples; they are great little offbeat collectibles. 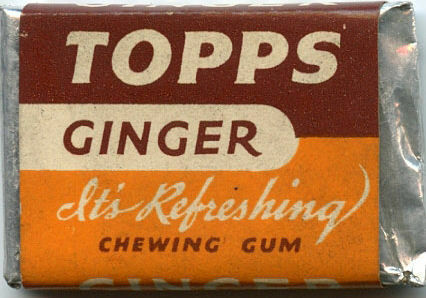 That gum display is quite interesting to me as it shows the Ginger flavor and also helps date that particular tab. Shep and I think it was replaced or overtaken by Pepsin soon after launch and you can find that flavor plus the Spearmint, Peppermint and Cinnamon varieties in tab form somewhat easily, same with their wrappers. 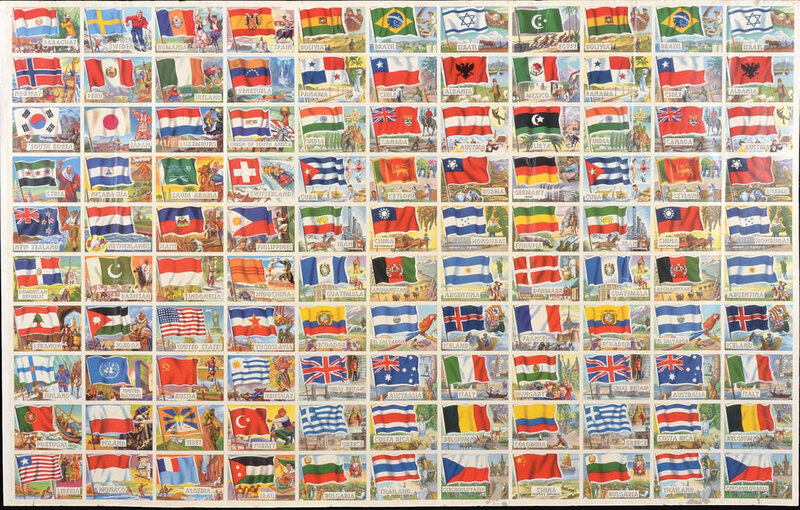 The New York City wrapper variant probably dates to 1939 then but I can't be 100% sure as the indicia of the ones in the display obviously can't be seen. Still, it's a good bet. 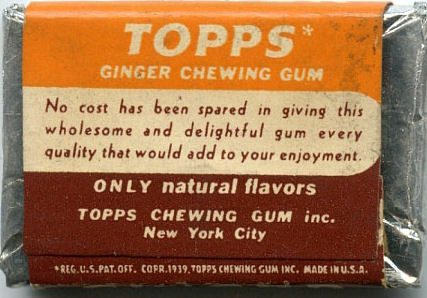 We also get a peek at a vending box sleeve, where 55 tabs of refreshing Topps Gum resided until slipped into a display. 60 Broadway, which is the Gretsch Building, was the first Topps production floor. 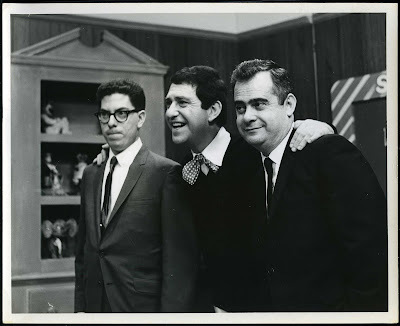 They didn't vacate the premises completely until 1965 despite moving their offices twice in Brooklyn before decamping to Duryea, Pennsylvania in 1966. They used it as warehouse space once they took more space just down Broadway a short time later. 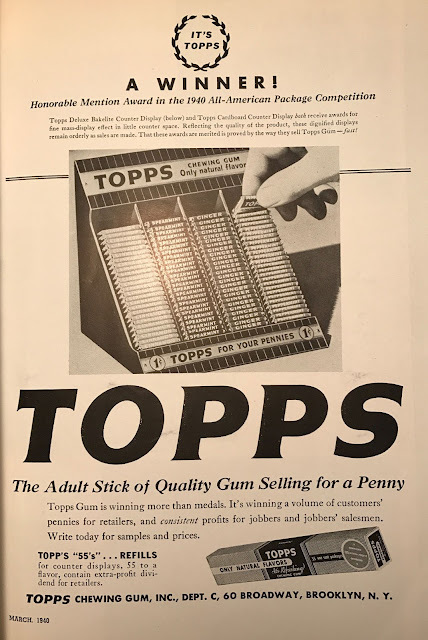 The economics of the time are quaint but those little extras, like five extra pieces of gum per vender, were a big part of the Topps sales strategy.